Happy Halloween! Mama and I hope each and every one of you has a fun time! I’m a Bumble Bee again this year. I haven’t been dressed up in this bumble bee costume for like three years! 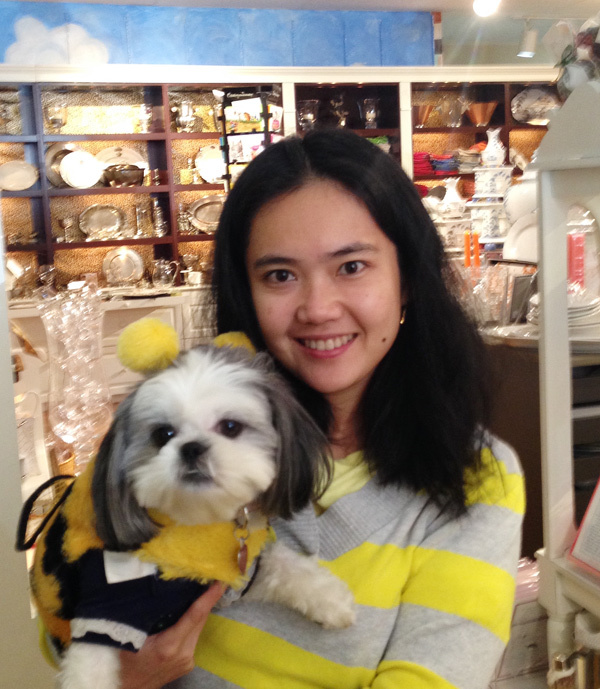 (See the post here, from 2011 when Mama dressed me up as a Bumble Bee on my first Halloween as a grown-up Shih Tzu. I was about one years old.) I do wear the costume well, though! Mama dressed up with me (kinda) in match yellow. And what do I have underneath the bumble bee costume? The French maid outfit from last year! It’s too cold outside, and Mama didn’t feel like going through the hassle of taking the outfit off me. Since I got groomed, my hair is really short, and it’s getting too cold here for me to be naked. So we just layered with the other costume. How adorable and fluffy am I? 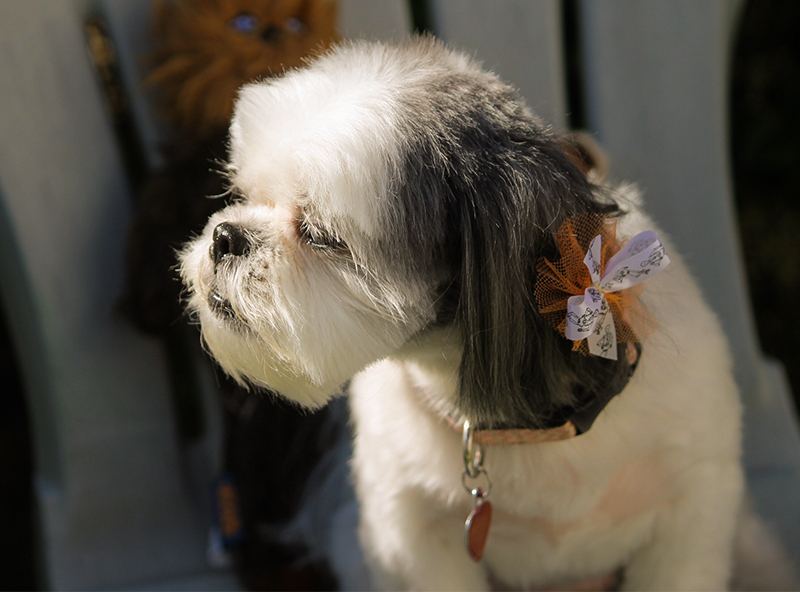 Look at this adorable autumn/orange bow that my groomer gave me. I just got groomed today. AND THEY BRUSHED MY TEETH! The groomer said that I did very well, and I was so sweet. I let them do EVERYTHING to me without fussing or any problem. Mama thinks it’s because I am a princess and like to get dotted on. 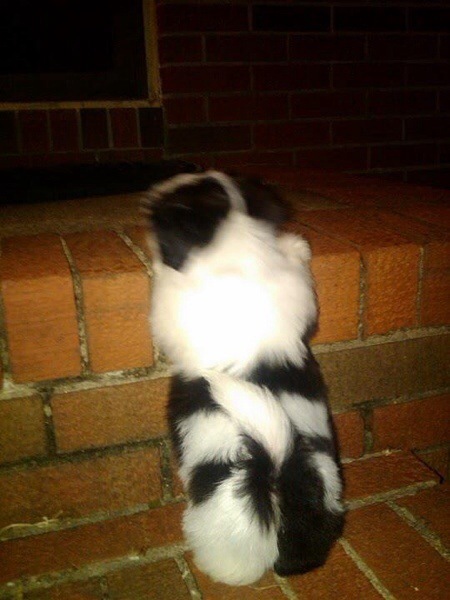 Here I am in mid-bark … or in my growl mood, because I spy my next-door-neighbor dogs, and I don’t like them. They are big and very aggressive since their owners never walk them. It’s really sad. They are just cooped up in the backyard and never get nice long walks like I do. Do you see my new Chewbacca toy in the background? You can see the pretty bow from the side of my head. There used to be two bows, one for each ear, but I shook the other one off. And don’t worry – by the end of the day, both bows had fallen off. They didn’t stick around for too long. I hate having things in my hair! By the end of the session, I was tired. Here I am lying down on the chair, because Mama would not let me bark at the neighbor dogs. 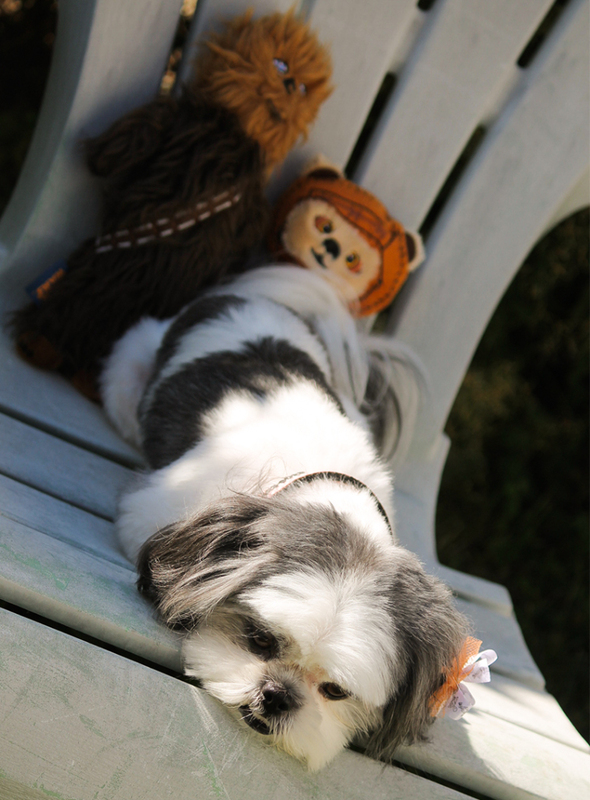 And you can see my Chewbacca and my Ewok toy in the background. Aren’t they super cute? She was going to buy Yoda too but then she thought it would be too much, and I already have way too many toys! I have developed this strange habit of drinking out of Momma’s water glass. 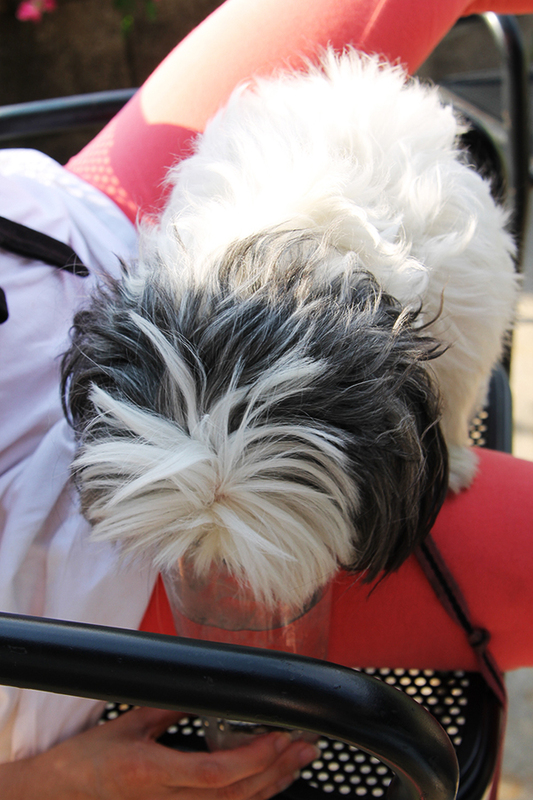 I like to poke my head into the glass and lick the water. I don’t know why, but Mama’s water is always so much tastier and more delicious than my own water bowl. Do any of you like to drink out of your momma’s glass? Also, this is me before my hair cut. I was super fluffy this summer. 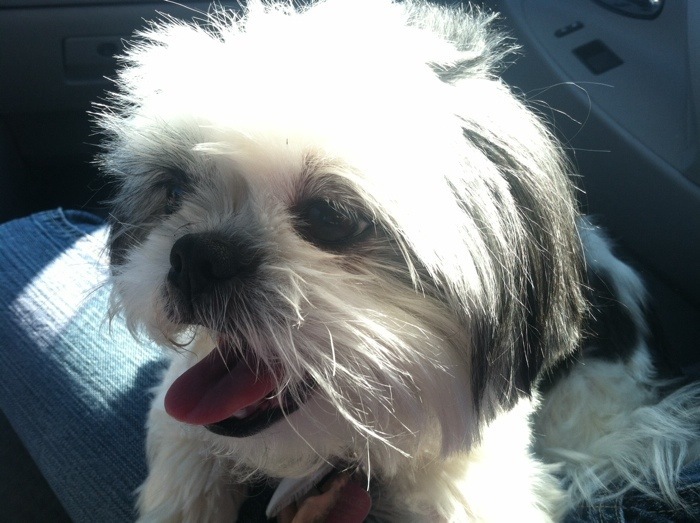 I am NOT so fluffy now, since I got a hair cut, but I was sure adorable then. Mama and I would like for you to all know that we do still love our Clementine, my calico cat sister. Even though she doesn’t get as much face time as me – since this is my blog, after all. So Mama has been feeling guilty that she doesn’t take as many photos of Clementine as she does me. Tonight, we fixed this problem. Mom snapped lots of lovely shots of my sister doing what she does best – lounging around. We especially love her cat-stache, just next to her nose. A baby freckle! 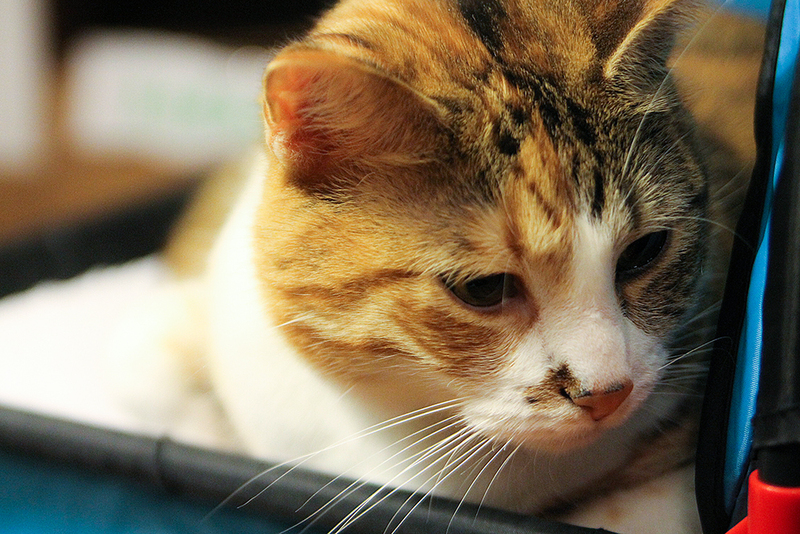 I don’t remember if I told you the story of Clementine’s Gotcha Day, but we adopted her two years ago, in December of 2012. My Auntie found her on the streets, so underweight that we thought she was a kitten at first. But when we took her to the vet, he said that she was over a year old (possibly, because it’s hard to tell with cats) and that she was a full grown adult. 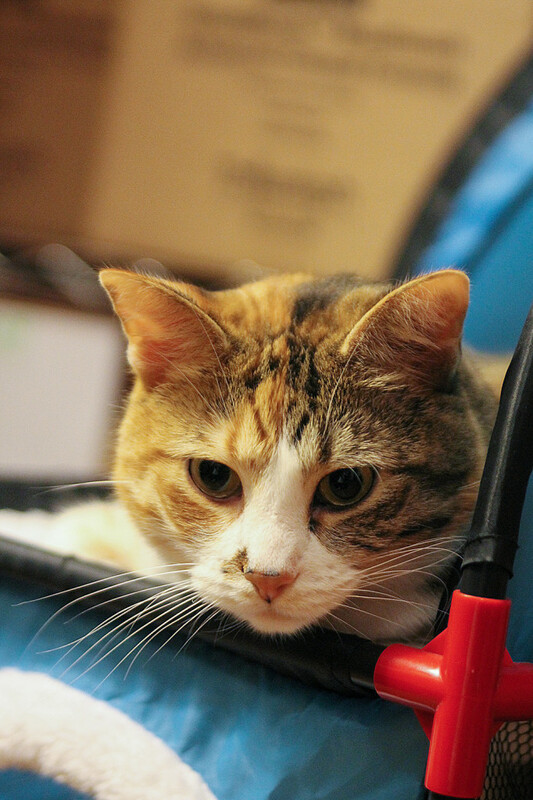 Auntie thought she would adopt her, and Mama was so against the idea of having another cat – since she had me, and that was enough, but then when Auntie decided that she couldn’t keep her and would take her to the pound, Mom said NO. 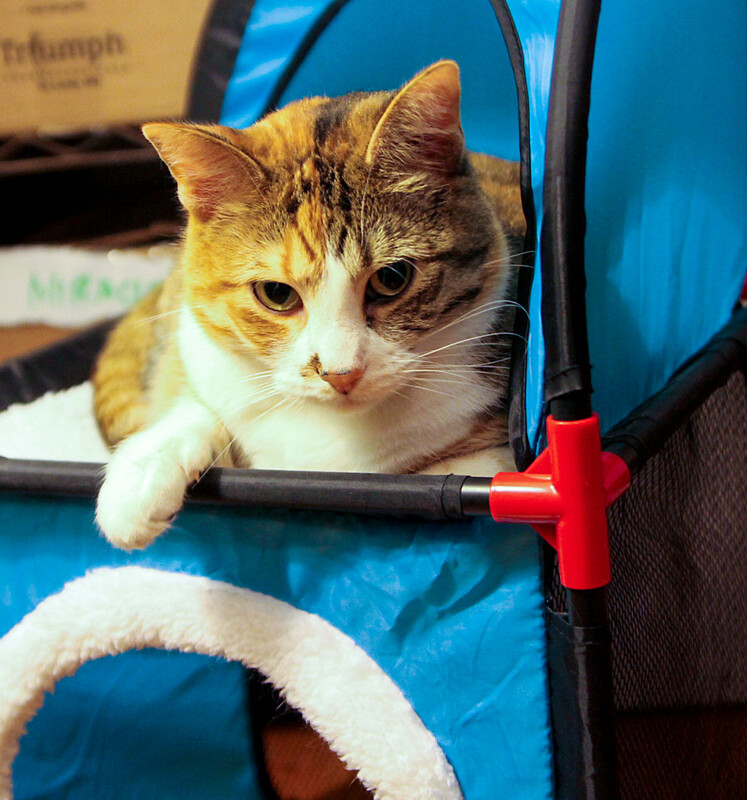 Because the likelihood of an adult cat getting adopted at the pound is slim to none. Mom couldn’t bear the thought of this sweet kitty – who is very cuddly and requires so much attention – getting euthanized. So we decided to make her part of our family. We love our Clementine and couldn’t live without her. Clementine is the sweetest kitty sister a girl could have. We love wrestling with each other (I think she’s a dog in a cat’s body), and we do occasionally enjoy snuggling. We are both attention hogs, so we sometimes fight. I always win though, and Clementine just runs away. Clemmie is always trying to hog Mama’s lap. She is a huge snuggler and loves purring and purring. She needs attention all the time. She is one of the neediest cats Mom has ever had. She’s like a dog but in a cat’s body. She is also funny in that she loves to wait for us by the front door when I go out for my walks. She’s wonderful. 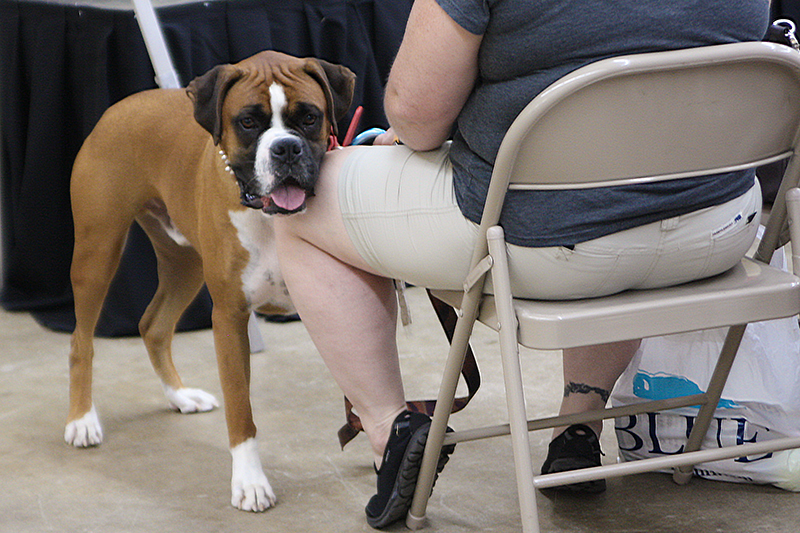 Last weekend at the Nashville Pet Expo, Gracie Lu and I had the pleasure of listening to a talk about the importance of Doggie DNA Testing from Celebrity Dog Trainer and Pet Expert Harrison Forbes. And this evening, I had the opportunity to interview Harrison Forbes directly about Doggie DNA Testing, Shih Tzus and Dog Training. Harrison Forbes, originally from Jackson, TN – two hours away from where I grew up – has always had a love of animals and an interest in dog behavior, from the time he was 8 years old and started working for a dog trainer who owned a small kennel in Jackson. His friends and good connections allowed him to be around great trainers. He’s a pretty impressive guy. 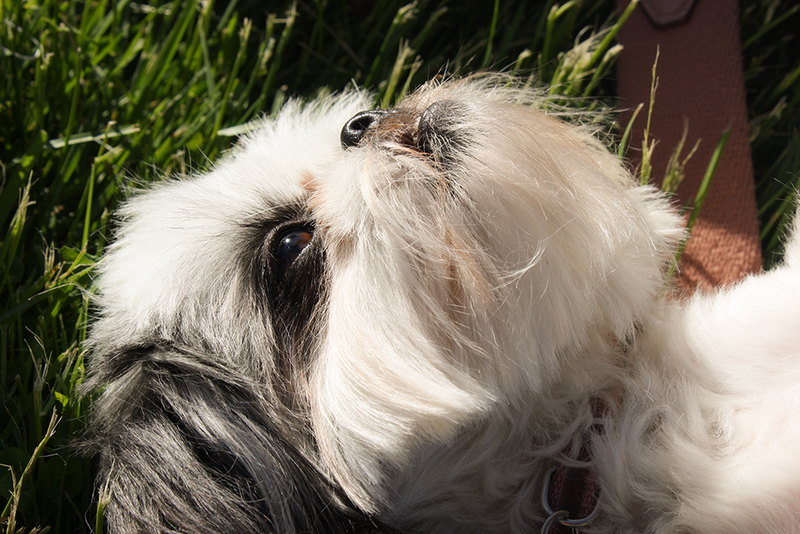 He makes Gracie Lu daydream of the day when she will become the world’s most famous shih tzu! And get to meet famous people, too! 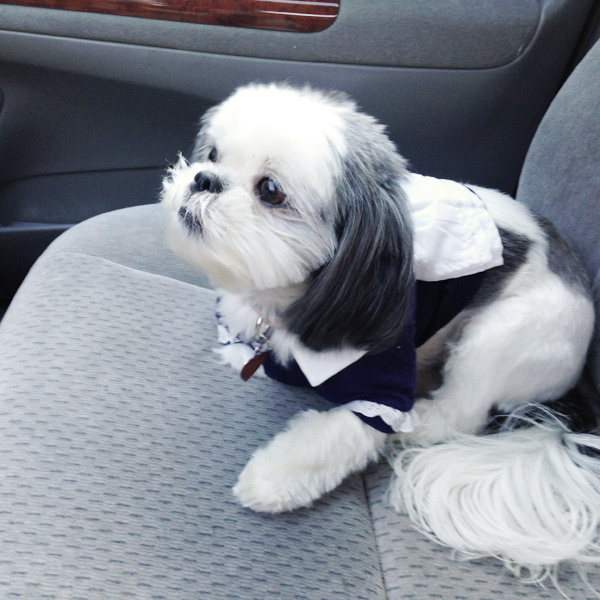 What I think is even more impressive about Harrison Forbes is the fact that he owns a Shih Tzu! 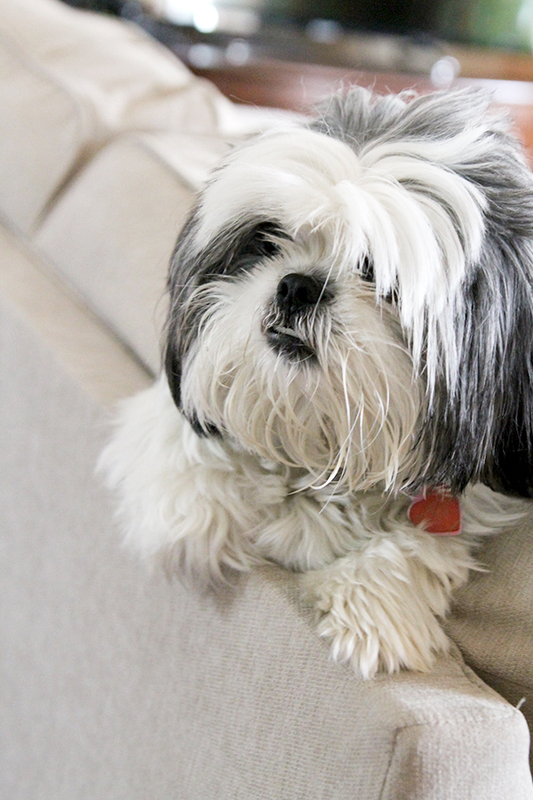 He’s a muscular, manly guy and yet he owns the most adorable, fluffiest Shih Tzu. 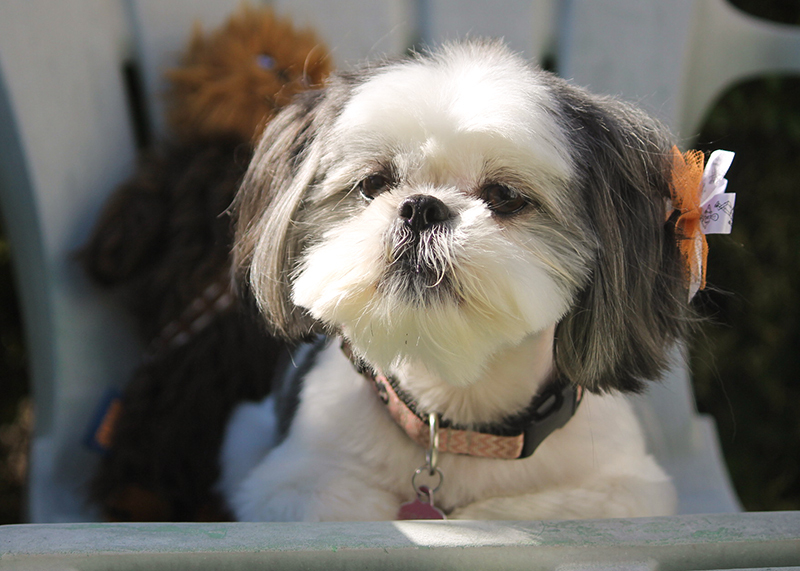 Meet Abigail Elizabeth, the 9-year-old Shih Tzu. She’s been around the raising of his kids and is a mellow, sweet girl. 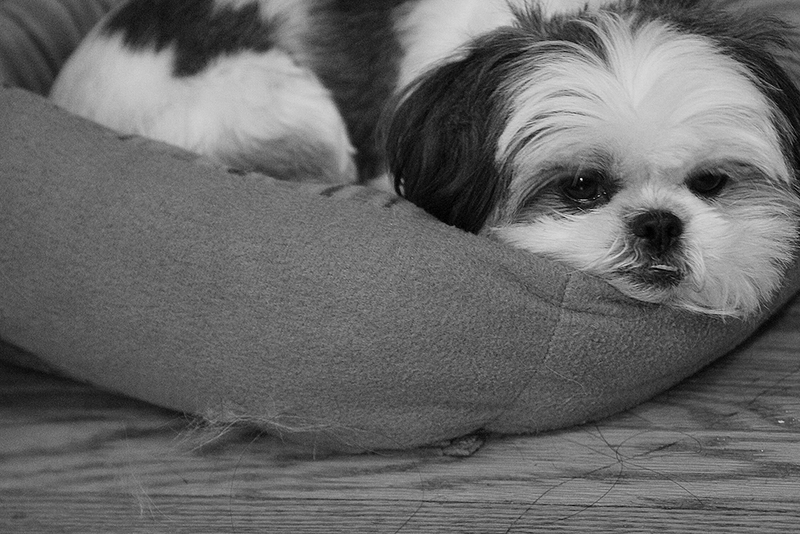 Like Abigail, Gracie Lu is pretty chill and relaxed. She is not a barker, except when it comes to other dogs. 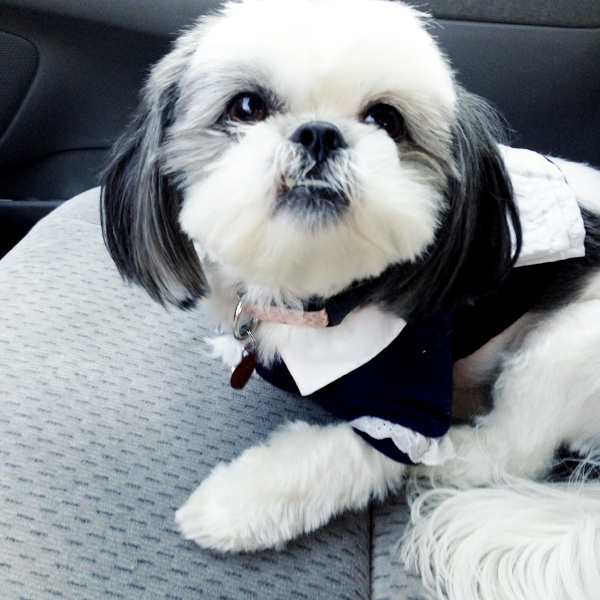 The moment that Gracie sees another dog, she goes crazy, barking – even aggressively and tries to run over to them. 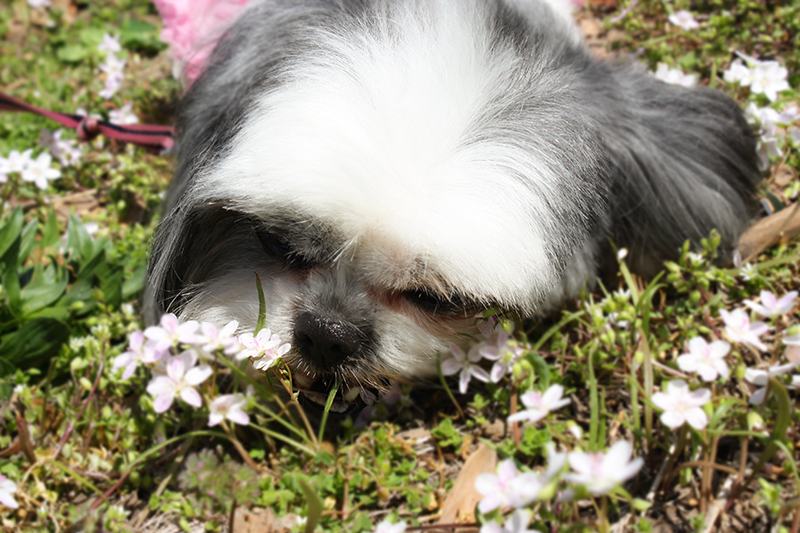 But when she gets close to another dog, she quietly sniffs them without any aggression or trouble. But the moment that the dog walks away, Gracie begins to growl and bark again. 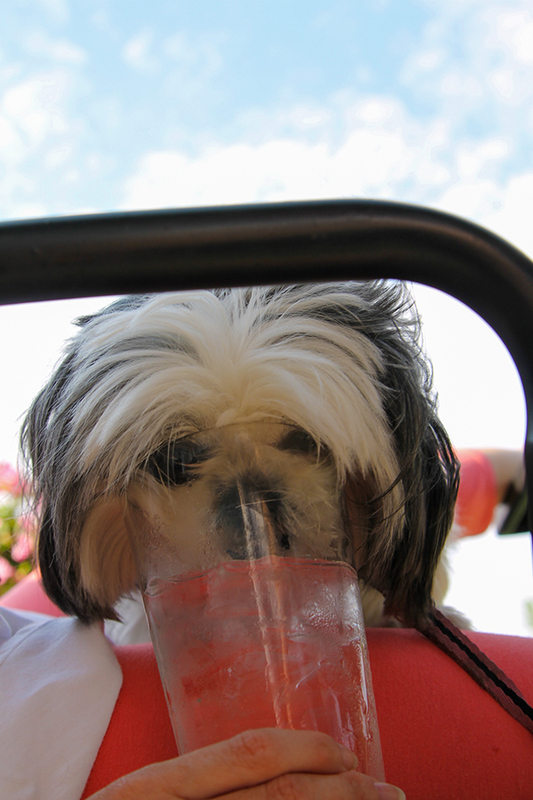 This behavior worries me, because Gracie Lu is such a wonderful dog in all other situations. Because Gracie grew up around a black lab – do you remember Bo? – and now we live 400 miles away, she misses that. “Dogs are pack animals. There’s a void that she misses and that can be frustrating. She’s barking at other dogs ‘I want to play,’ but they can’t play and that is frustrating. The barking is out of frustration,” Harrison explained. To help Abigail with this exact same problem, Harrison took her to a doggie daycare, where she was around other dogs for eight hours a day. The socialization helped and mellowed her out. I didn’t know much about Doggie DNA testing before listening to Harrison Forbes’ talk, but it’s interesting to learn how advanced research has come in this field. 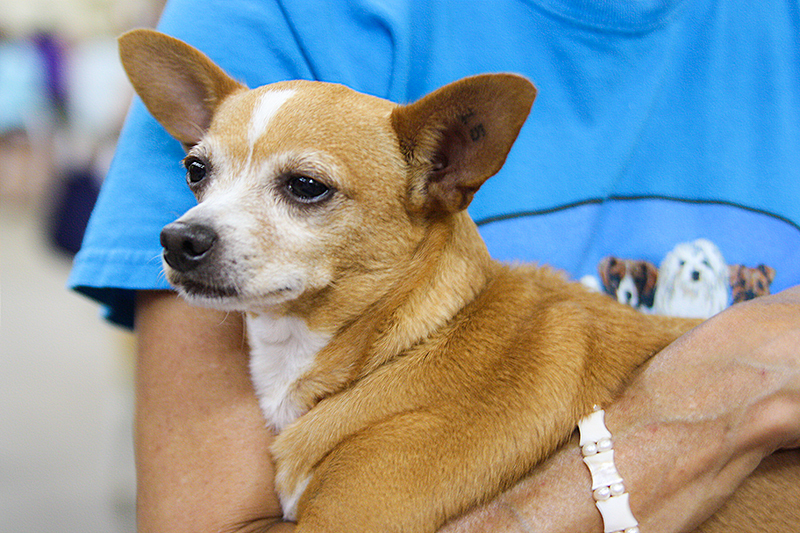 For many years, DNA testing only came from a blood test performed at a vet’s office. Now, it’s a simple cheek swab that you can do in the comfort of your home. You can buy a Wisdom Kit or one from Petsmart, Petco or from other retailers. 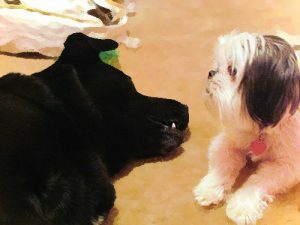 “Finding the DNA history of your dog can help predict behavior and the possibility of genetic problems that certain breeds have. From a behavior standpoint, it can help you predict the predisposition of behavior. 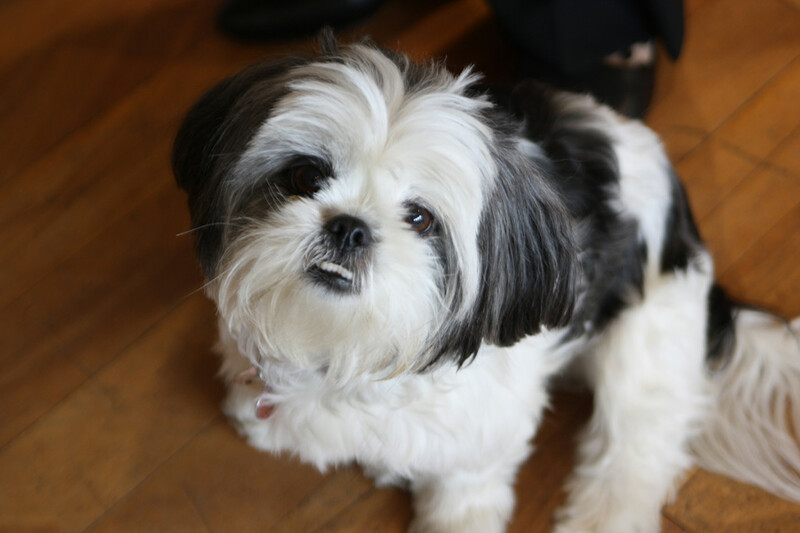 If you’ve had a dog for a long time, DNA testing can help you understand the WHY to their behavior,” says Harrison. 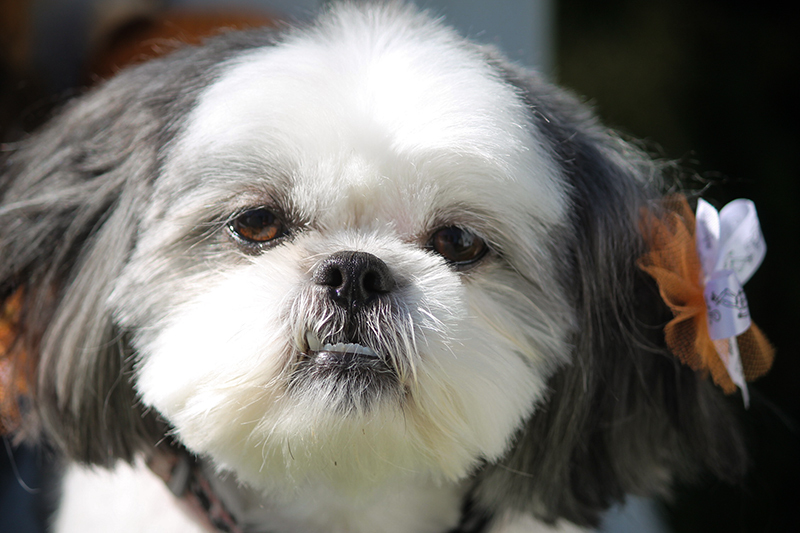 A dog’s ancestry can influence your dog in many ways. 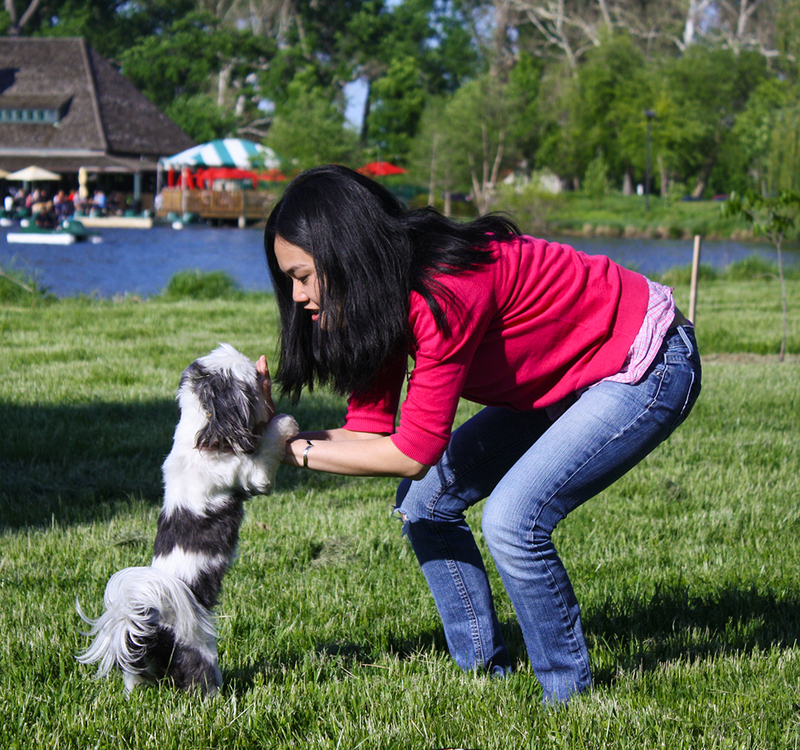 Interesting traits and behaviors, like digging and barking could all be related to the dog’s breed or combination of breeds. It can help you understand more about why your dog does certain things, and help you create a tailored training regiment to suit his needs. Thank you to Harrison Forbes for taking time out of his schedule to chat with me. Tune into his new show, starting on August 14th, Pet Talk with Harrison Forbes, a one-hour talk show all about pets -including celebrity pet interviews, Ask the Vet, Ask the Trainer, and other interesting segments. We are super excited about it! You haven’t seen my fluffy face in such a long time, because Mama has been super busy. She just launched a eco-friendly and organic pregnancy and baby store – Preggie Baby Boutique and she’s been super busy working on that website and fulfilling orders and all that fun stuff. I’ve been helping with the “de-stressing” part of it. Licks, cuddles and snuggles make Mama feel so much better, especially after a hard, overwhelming day! Over the weekend, Mama and I visited my grandparents this weekend. 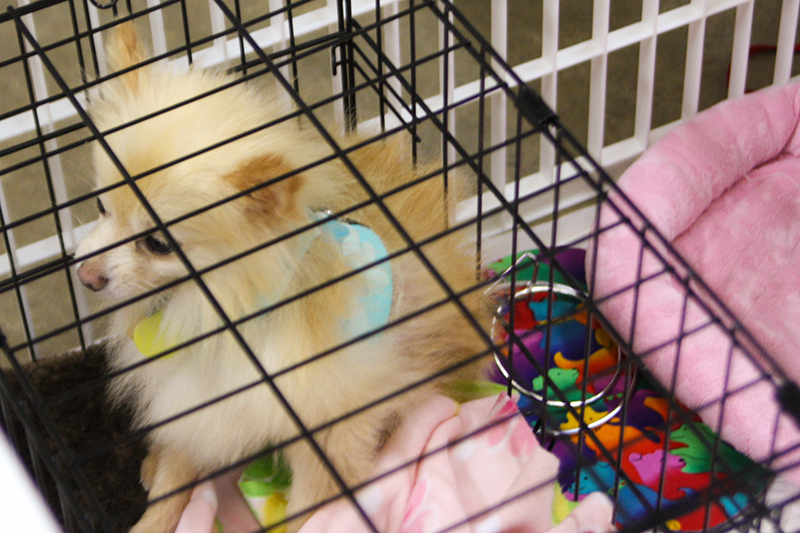 Grandpa, Mama and me went to the Nashville Pet Expo! It’s a free event with lots and lots of exhibitors from all over. I think they have it every year, and it sounded fun so we went! So this event is FREE and they let you bring your dogs! Mama carried me around in a baby sling, because she didn’t know how I would react being around so many other doggies and people. (That can be very stressful on a little doggie!) I was very happy to be in the sling, and I just looked at all the sights around me. 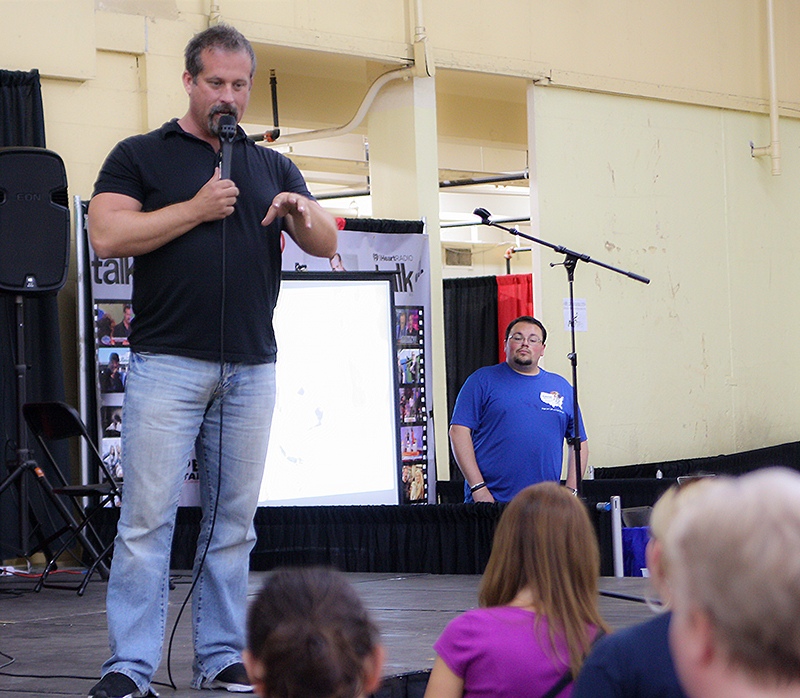 They bring in big name speakers and celebrity dogs to this expo. 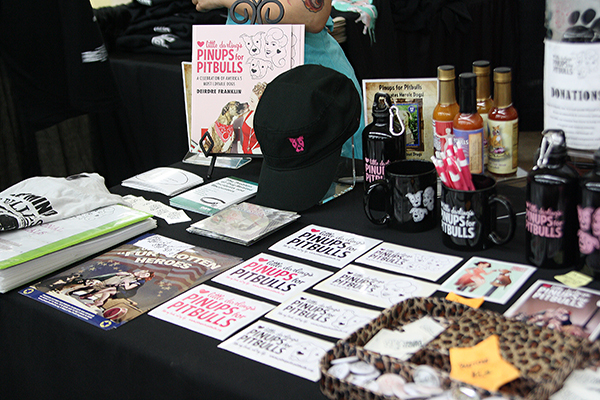 Shorty Rossi – aka the “Pit Boss” and Hercules made their appearance at the Pet Expo, along with Horrison Forbes, the Celebrity Pet Expert. Their was a costume contest (which I missed because it was too late in the day, and we were there earlier in the day). There were so many different dogs there – big dogs, little dogs, and medium sized ones. 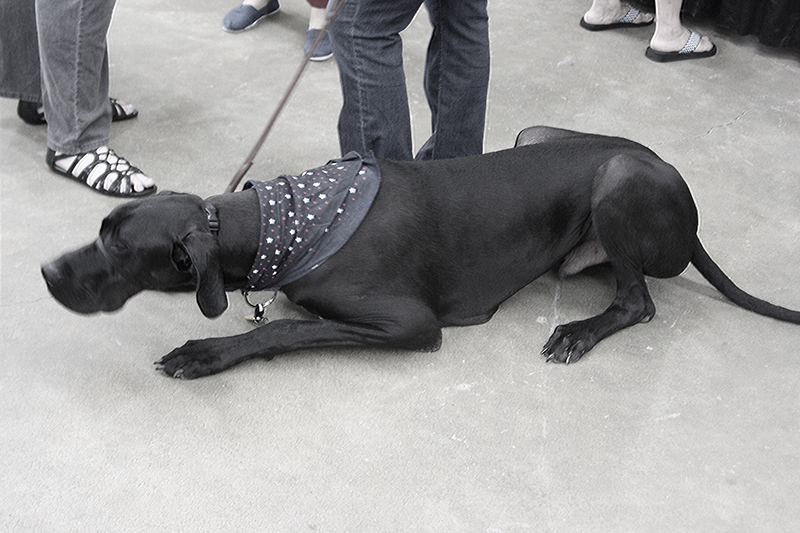 We saw some huge Russian terriers (but didn’t get to snap their photo), along with normal breeds we see every day. 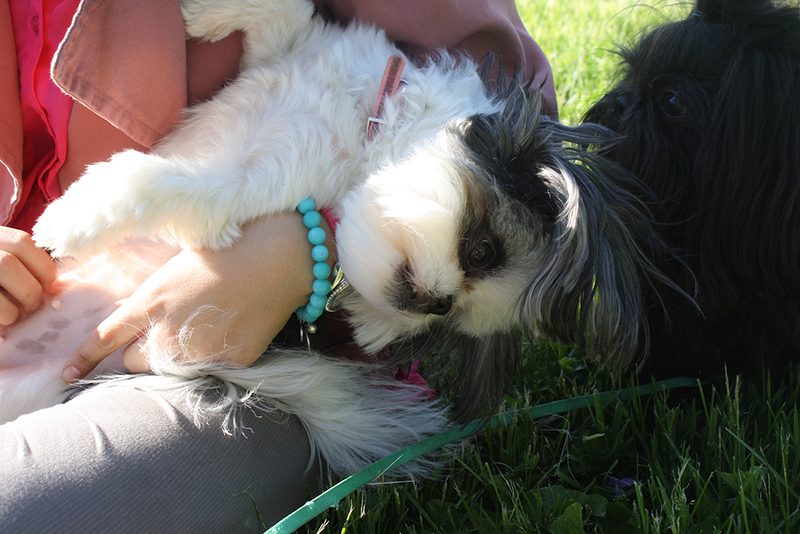 Here are a few of the cute doggies we snapped photos of! 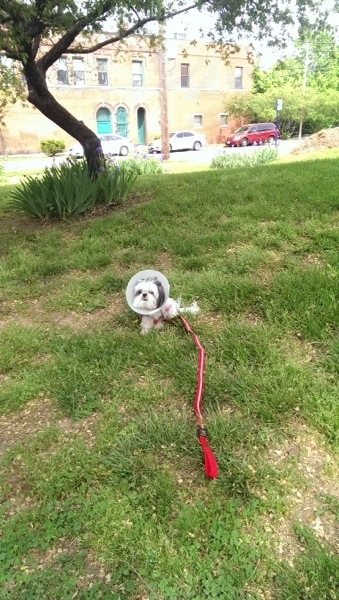 I was in a baby sling but we saw lots of stylish doggie strollers that pet owners had! Mama and I ran across this very cool booth. 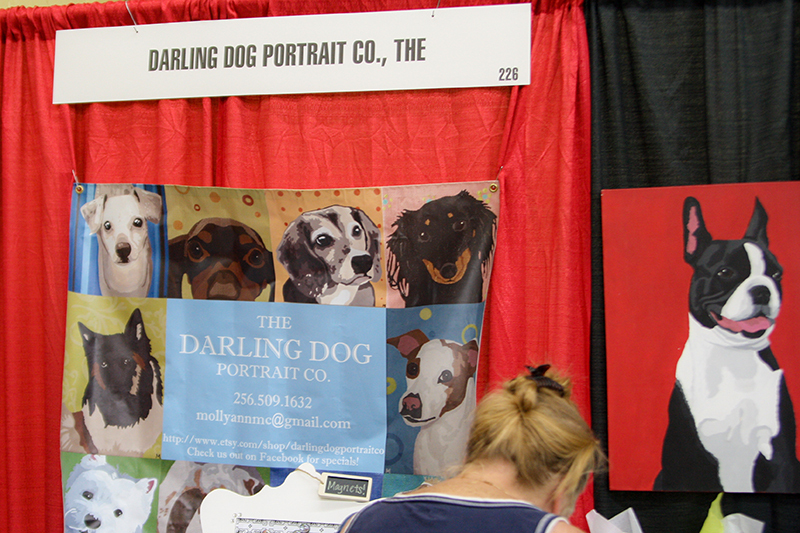 The Darling Dog Portrait Co was offering to take FREE photographs. They had a box of dress-up clothes for doggies, and you could get dressed up. Of course, Mama couldn’t help but make me dress up. So here we are. 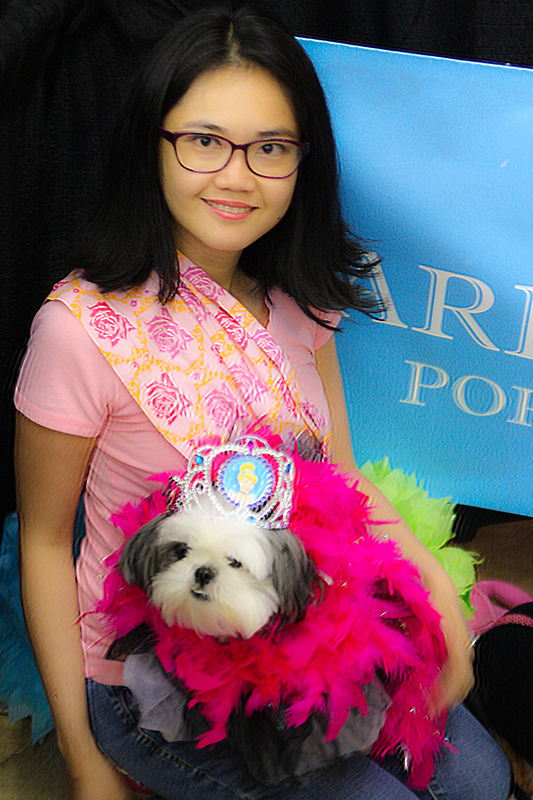 I look so sad and pathetic, but yes, that is a Cinderella Tiara and hot pink feathers that Mama made me wear. So humiliating but at least Mama had a good time at my expense. 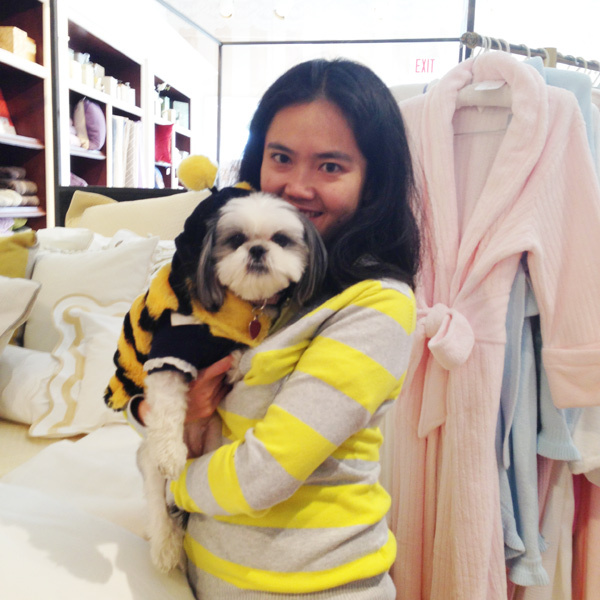 I have started to detest getting dressed up, but my Mama still likes to make me — sometimes… when I put up with it. After my humiliating dress up experience, I got treats (of course!) 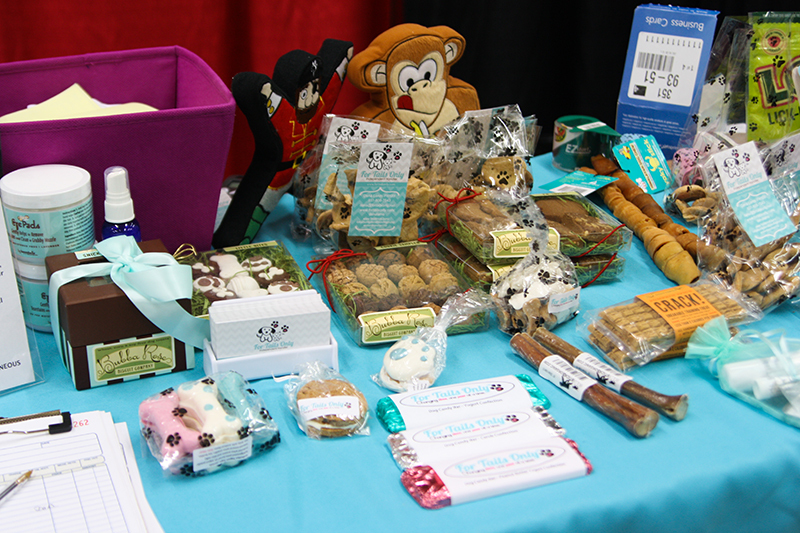 Some of the other booths were from dog bakeries and doggie stores. 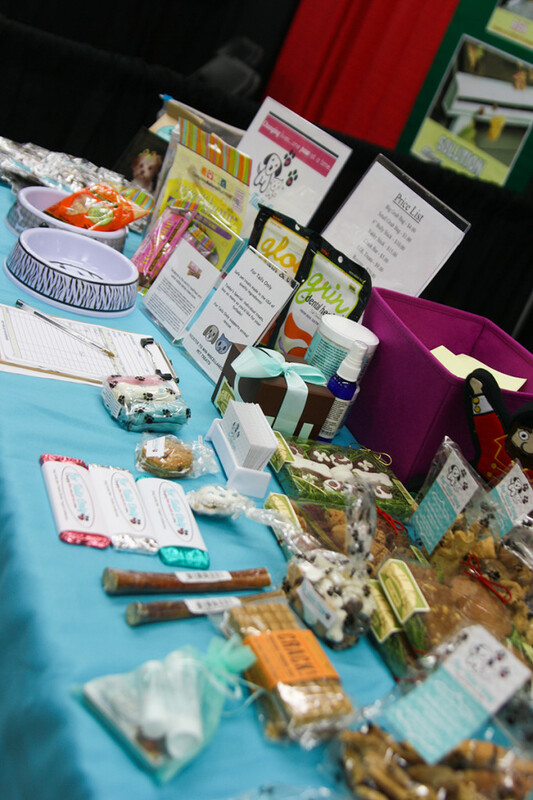 Look at their tables full of healthy dog snacks and treats. Doesn’t it make your mouth water? We wanted to spotlight this booth, because we think it’s super cool. 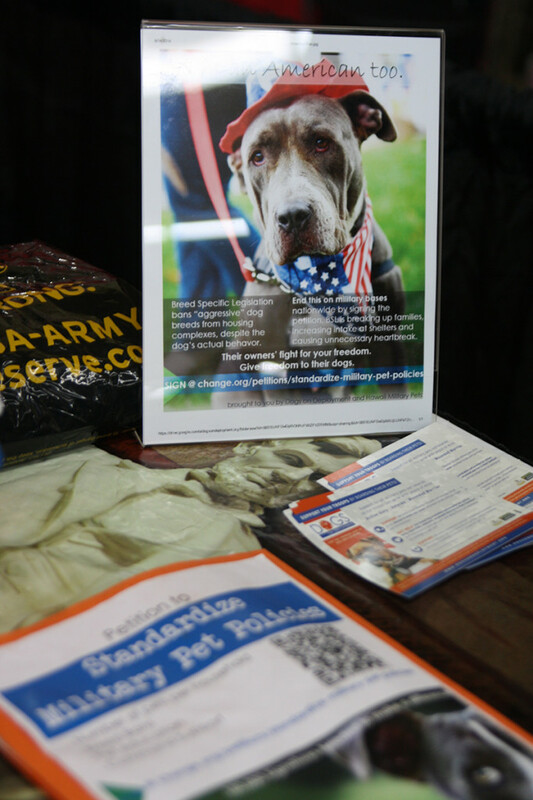 Dogs on Deployment is a non-profit, which offers foster homes to dogs and pets of soldiers who get deployed overseas. Isn’t that so cool? The dogs are taken care of by foster families while their owners are away fighting for our freedom. We love the idea. This was another cool booth we saw. It’s Pinups for Pitbulls – a calendar of beautiful girls and their dogs, and it is all about raising awareness to rally against Breed Specific Legislation (BSL) and Breed Discriminatory Laws (BDL). Cool, huh? 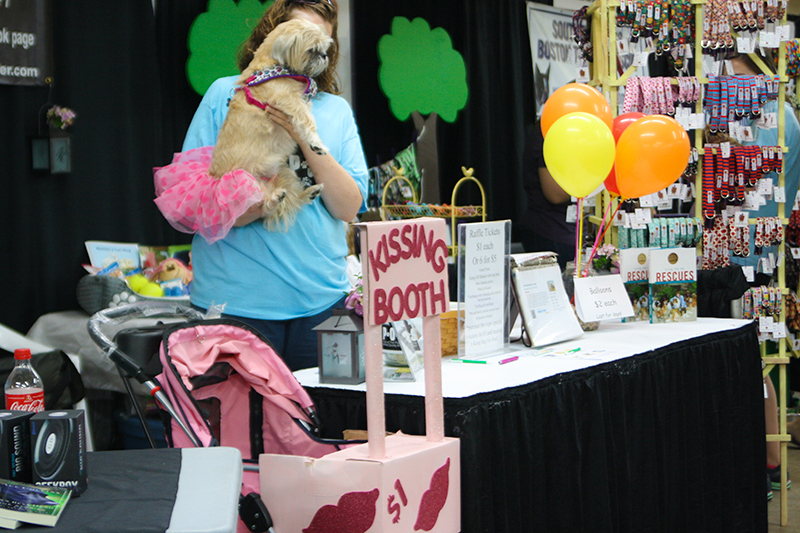 At the Nashville Pet Expo, we also saw lots of doggies from rescues who needed homes. 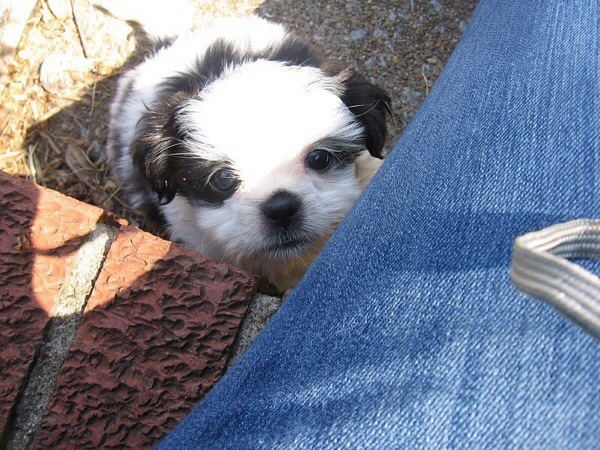 Like this adorable pup from Small Breed Rescue of East Tennessee. Isn’t she adorable? We wish we could have adopted her. She’s so beautiful. All in all, we had such a fun time and hope we can go again next year! Today is my birthday! I turned four today, and mama has been reminiscing about how fast time passes. 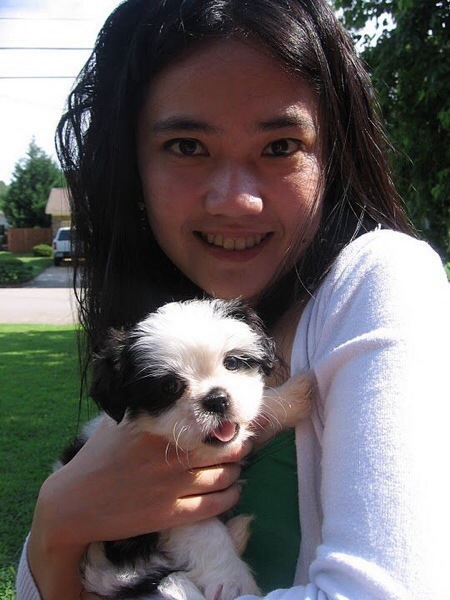 I used to be teeny tiny. Can you believe I wasn’t even as tall as a single step? Mom wishes she had taken more photos of me when she had the chance but they didn’t have fancy iPhones back then that made taking photos a snap. Mom got me when I was 6 weeks old and I’ve been with her ever since. 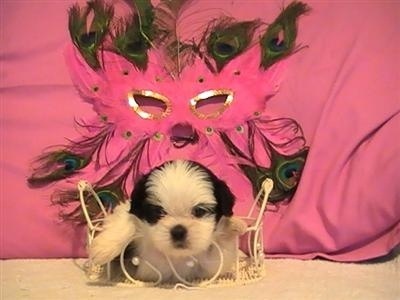 Here is the photo of me that Mama saw that made her have to have me! It was love at first sight! Mommy and me have been in love for a long time. I was so cute when I was little! Mommy and me were quite an adorable pair. I was her very first dog that she owned. 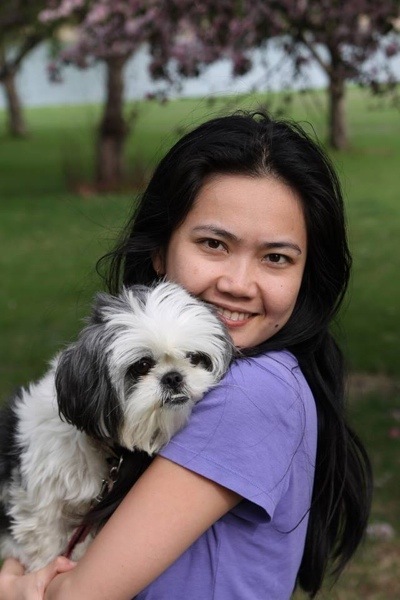 She wanted a Shih Tzu since high school and she is so thankful for me every day. I make her sad says even better! Here we are today! I think we still look like the perfect couple! 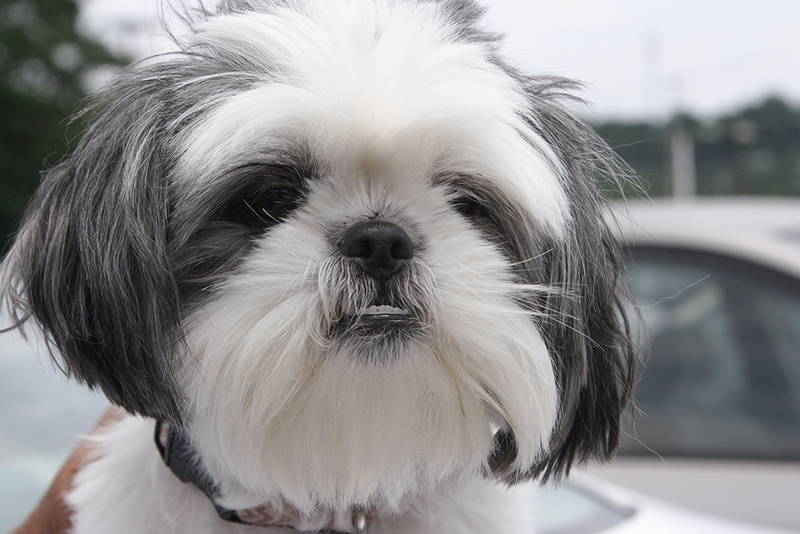 Though I am much fluffier now than I was when I was a wee Shih Tzu. Today I had a super awesome birthday! 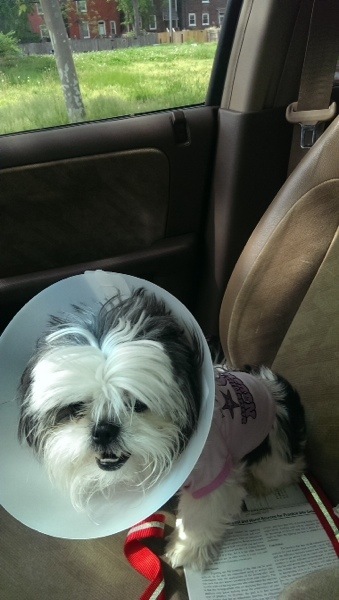 I got spayed last week and my stitches finally came out! Yeah! Though I still have to wear that stupid cone of shame for another few days since I am notorious for cleaning myself and mommy doesn’t want me to risk an infection. But I got to go to the park afterwards and it was fun, fun! I have the best life with my mom. Here’s to hoping the next four years will be just as fun as the last four. Who has the prettiest brown eyes? Um … me, that’s who! Mama snapped this photo of me on the job. We were having a book signing at Mama’s workplace, and here I was, looking so sweet and adorable, gazing up at my Mama and she just had to take a photo of me! Aren’t I cute? And don’t I have the sweetest puppy eyes you’ve ever seen! I’m happy it’s spring! Yeah! Warm weather! With all the weather getting warmer, I’m ready for spring. 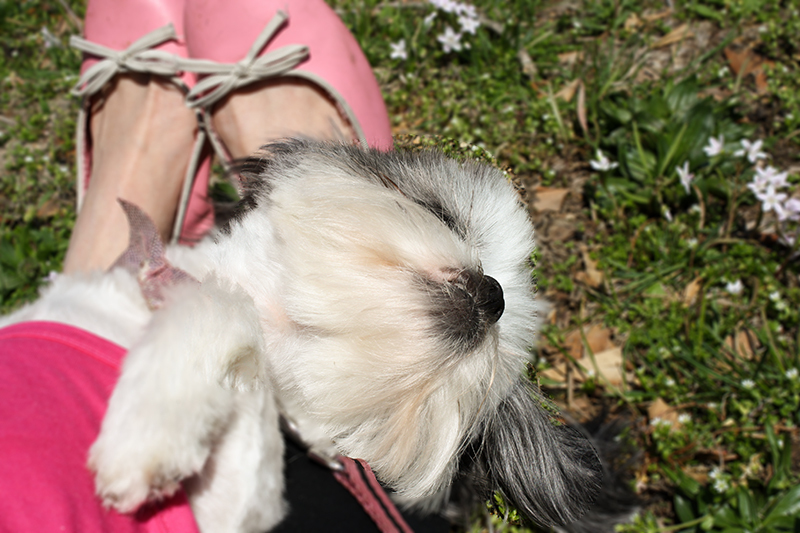 What a fun life it is for a shih tzu, just hanging up side down Mama’s lap. And trying to eat flowers. And here are my toofers. Aren’t I adorable?